MILAVIA Military Aviation Specials - 30 Year Anniversary 5° Reggimento Aviazione dell’Esercito "RIGEL"
Photo Report : 30 Year Anniversary 5° Reggimento "RIGEL"
Giampaolo Tonello attended the 30 year anniversary of the 5° Reggimento “RIGEL” and contributed this nice report with photos of the helicopters decorated with anniversary markings. 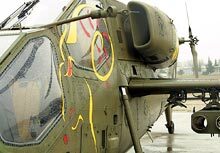 2006 is a very important year for all the Regiments (Reggimenti) of the Italian Army Aviation (Aviazione dell'Esercito) as they celebrate their 30 year anniversary. In fact on January 1, 1976, the Cavalleria Dell’Aria became an independent unit with its own Regiments which gained the names of the different constellations. This is obviously also true for the 5th Reggimento “RIGEL”, based at Casarsa della Delizia in the North-East of Italy. 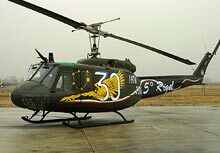 The 5th Reggimento “RIGEL” was established with the union of the Vth REUG (Reparto Elicotteri ad Uso Generale) and the Vth RAL (Reparto Aviazione Leggera). Nowadays the 5° RIGEL consists of the 49° Gruppo Squadroni “Capricorno” flying the A-129CBT Mangusta and the 27° Gruppo Squadroni “Mercurio” flying the AB-205, the AB-206 and the A-109T and the Lupo support group. In these 30 years the 5° RIGEL has flown many military and humanitarian missions, starting in 1976 with aid for the national population after the big earthquake in the North-East of Italy up till the recent UN missions in Bosnia-Herzegovina, Somalia, Mozambique, Namibia, Macedonia, Kosovo and Iraq (these last two are still running). 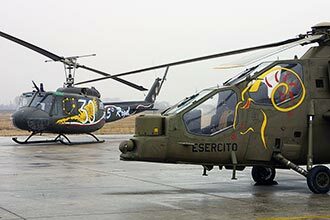 On February 18, 2006, the 5° Reggimento Elicotteri Aviazione dell’Esercito “RIGEL” celebrated its 30-year anniversary with a small but well-organized event. During the ceremony a formation of 15 helicopters conducted a fly-by over a new monument (AB-206C1 EI-516) positioned in the centre of the town. After that two A-129 CBT Mangustas performed a great duo display for the invited audience. AB-205 EI-307 dedicated to the 5° RIGEL. 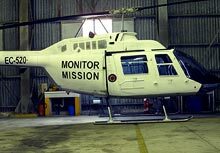 Inside the hangar of the A-109T fleet there was also an AB-206 in the white ONU (UN) scheme with “Monitor Mission” insignia. This particular helicopter was used in shooting the movie “Gli eroi di Produte” ("Heroes of Produte"), which will be ready by the end of April this year. This movie is dedicated to the military servicemen, four Italian and one French, that died after their AB-205 (EI-305) was shot down by a MiG-21 of the Yugoslavian air force during a UN monitor mission. AB-206 EC-520 was flying together with the AB-205 when it happened; however the AB-206 used for the movie and spotted here is really coded EI-617. An historical display was also prepared in the big A-129 hangar with aero models, videos, photographs and the new 2006 calendar was presented to all of us. Presented here is small walk-around of the A-129CBT Mangusta combat helicopter. So now we must congratulate with the 5th RIGEL people who gave us the big opportunity to be part of this nice event. A special thanks to M.llo Zanot from Lupo support group, who helped me writing this article.